When dividing the mesh with smoothing active, the shape and placement of polygons in lower levels change. With the Cage button pressed, ZBrush recalculates the placement of the base vertices so the object conforms to its pre-divided shape. Before generating a displacement map for this object, the original low-res base mesh must be restored. If it cannot be recalled or imported, the Cage button provides a means of approximating it. The button is inactive when the highest-resolution mesh is selected. Freeze SubDivision Levels will preserve higher level detail when using DynaMesh. 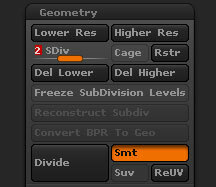 The Reconstruct Subdivision button attempts to construct a lower-resolution mesh level from the current lowest level. If successful, the new mesh becomes level 1, and the current lowest level becomes level 2. The Convert BPR To Geo button will convert a BPR render result of MicroMesh or FiberMesh into actual geometry that can be sculpted. If this object is a polymesh, and no portions of the mesh are masked or hidden, a new, higher alternate mesh resolution is added. You can switch between higher- and lower-resolution meshes and perform appropriate edit actions; ZBrush automatically applies the edits to lower- and higher-resolution meshes. The Smooth UV button, if pressed, determines that UV coordinates are smoothed when the next Divide or Edge Loop action is performed. When the Edgeloop Masked Border button is pressed ZBrush will slide the masked portion of the surface and create a new polygroup. This would be like using the Slice Curve around your mask. When a portion of the mesh is hidden, the Extrude Edge Loop button adds polygons to the edge of the visible mesh’s edges by dividing the polygons which lie along its border. If any points are moved after hiding the mesh portion, the Extrude Edge Loop button only adds polygons between new points’ locations and their old ones. Depending on the settings of the Inner Regroup and Outer Regroup buttons, these new polygons can be assigned a new color-coded group ID, or can be incorporated into the existing group(s). The Crisper Extrude button affects the way the Extrude Edge Loop button divides the edge polygons. When pressed, polygons are divided nearer the outer rim of the visible mesh. When the mesh is divided with smoothing active, this rim provides a crisp corner transition. The Displace Amount slider determines by how much the visible groups are extruded (pushed out from the object’s center) when the Extrude Edge Loop button is pressed. If this slider is set to 0, edge polygons are added but no extrusion takes place. The GroupsLoops button will add edge loops around all polygroups. The number of loops is determined by the Loops slider. GroupsLoops can only be used with a model with no subdivision levels. Set the Loops slider to the number of edge loops that you want around each polygroup when using the GroupsLoops button. The GPolish slider controls the amount of polish applied to the surface when GroupsLoops is pressed. 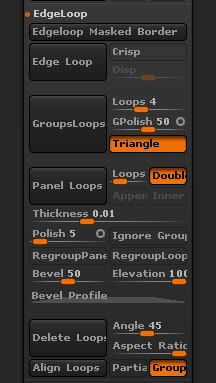 Turn on Triangles to allow triangles to be used in the resulting mesh when the GroupsLoops button is pressed. When the Panel Loops button is pressed ZBrush will convert your existing model into a set of separate surfaces with thickness (panels). These panels will be defined by the polygroups or visible polygons. Various settings alter the final result. Each panel has an inner and an outer surface connected by a bridging strip. The Loops slider determines how many loops will used in that bridge. The more complex the bevel shape defined in the Bevel Profile curve (see below) the more loops will be needed to accurately create the bevel. Bear in mind that each loop will increase the polygon count. When the Double option is turned on panels will be created with front and back surfaces. This is on by default. When Double is turned off, the panels are created as bevelled sections on the original surface, not separate pieces of geometry. When the Append option is turned on, ZBrush does not replace the original polygroup and surface when creating the Panel Loop but adds the new panel as a separate piece on top. This is very similar to the Tool > SubTool > Extract function, except for the bevel options possible with Panel Loops. Note that if Double is turned off then the new panels created will be open surfaces not closed volumes. With the Inner option turned on the panels will be created inside the model rather than outside. The difference between Inner and a negative Elevation setting is in the direction of the bevel shape relative to the original surface. The Thickness slider defines the thickness of each panel, as well as affecting the distance between the panels. The Bevel Profile curve can also have an effect on the panel cap. If the curve is closer to the bottom of the graph, the cap between each panel will be enlarged. The Polish slider affects the amount of polish applied to the panels, especially at the polygroup borders, so as to create smooth edges. Polish has two different options and you can switch between them by clicking the small circle at the right side of the slider. An open circle will reduce the over all smoothing. This may create some overlapping where the bevels meet but this can be smoothed later with Polish By Feature (in the Tool > Deformation sub-palette). It may also produce sharp points where three or more panels meet. A closed circle will result in all polygroup borders being rounded. If only a portion of the mesh is visible and the Ignore Groups is turned on, only the visible polygroups will be used for the Panel Loops process. The advantage of this would be if you wanted to create additional panel pieces caross an already created panel and not have ZBrush create panels for every polygroup. The Bevel slider defines the size or amount of bevel on the bridging strip between the panel front and back surfaces. The Elevation slider defines the height of the panel relative to the original surface, letting you specify whether the panels will be raised above or submerged below the surface. A positive setting will result in panels above the surface; a negative setting will result in panels below the surface. The Thickness and the Bevel settings are related. Having a high value for one and a low value for the other can create unexpected results. For example, if the thickness is set very low setting the bevel to a high value may result in overlapping polygons. The Bevel Profile curve defines the shape of the bevel that is created along the bridging strip between the inner and outer surfaces of each panel. The left side of the curve is where the bevel connects to the existing surface, while the right side is its outermost edge. The height variations of the curve then define the shape of the bevel cross-section. The height of the curve controls whether the bevels on adjoining panels will meet or overlap. If no part of the curve goes above the midpoint then the panels will not meet. The more the bevel profile goes above the midpoint, the more the adjoining panel bevels will overlap, and appear to be connected. The Delete Loops function analyses the mesh to find edge loops that are not needed for maintaining the general shape of the mesh. It then deletes those loops based on the settings. Delete Loops uses the curvature of the surface in its calculations and ignores edge loops at mesh borders. Areas can be masked or partialy masked so as to protect parts of the mesh or modulate the results. The Angle slider defines the angle tolerance of the deleted loops. Low values will remove a minimum of loops, keeping the curvature close to the original, while higher values will be more destructive. The Aspect Ratio slider defines the maximum relative width and height ratio allowed for each new polygon created by the Delete Loops feature. For example, a setting of 4 would mean that a polygon’s height could be no more than four times its width, regardless of the Angle setting. 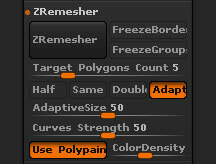 In other words, ZBrush will first analyse the mesh based on the Angle setting to determine where loops can be removed. It will then check to make sure that the new polygons created by removal of a loop will not exceed the Aspect Ratio setting. If they do not, the edge loop will be removed; if they do, the edge loop will be kept. The Align Loops function is similar to Delete Loops, except no edge loops are removed. The mesh is analysed in the same way but instead of deleting loops, the topology is adjusted so that the resulting shape is exactly as if the Delete Loops button had been pressed. Because Align Loops does not alter the number of polygons, you can store a Morph Target first, and then restore parts of the original mesh using the Morph brush, with interesting results. Partial mode allows Delete Loops to analyse partial as well as complete loops. For example, a DynaMesh will often produce partial loops where the ends do not meet; this option allows Delete Loops to work with such a mesh. 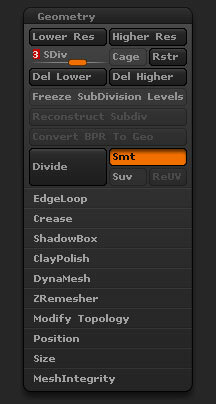 With the Groups option turned on, ZBrush will ignore edge loops that define polygroup boundaries. The Crease button adds a tag to the edges of a partially-hidden mesh. When the mesh is subdivided and smoothing is performed, these edges are protected from smoothing. The tag is visible in Polyframes-view mode, as a dotted line which runs along one side of an edge. Creases can be defined on one or both sides of the edge, providing a crease which is partially rounded or not at all. When Crease tags are assigned to the edges of an open mesh (such as a plane object), they protect the edges from shrinking inward when smoothing is performed. Creases are similar to Crisp edge loops, but create hard corners without changing the polygon count in the mesh before subdividing. Shift-clicking this button assigns Crease tags to the edges of all polygons in the visible mesh portion(s). The Crease All button will crease all edges for the selected mesh. Crease Edges Tolerance (in degrees). The Crease Level slider works in conjunction with the Crease function and the smoothing which occurs when meshes are subdivided. It determines the maximum number of subdivision-levels in which Crease tags are effective. For example, if this slider is set to 2, Crease tags yield hard corners only in the first two subdivided levels (levels 2 and 3). When the mesh is subdivided to form higher levels, these corners are smoothed. The result is slight rounding in these corners, determined by the resolution of the higher levels. This slider can be adjusted after subdividing to form multiple levels. If you switch to the lowest resolution (level 1), then adjust this slider, then switch to higher levels, these changes are propogated through the levels appropriately. The UnCrease button removes Crease tags assigned by the Crease button, from the edges of the visible mesh portion(s). The UnCrease All button will remove all creases from the selected mesh. The Crease PG button will crease the eges of all polygroups. The UnCrease PG button will uncrease the edges of all polygroups. Creasing inside the polygroup borders will not be affected. The Bevel button will apply a bevel to creased edges. The bevel can be adjusted using the settings described below. When turned on, the Proportional Width option will maintain a constant bevel width when a bevel is applied to creased edges. The Resolution slider determines the number of edge loops that will be created when a bevel is applied to creased edges. 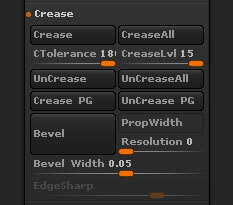 The Bevel Width slider controls the width of the bevel when a bevel is applied to creased edges.. The ShadowBox button will establish a three sided box that will allow masking on all three planes. By masking out one or all three planes ShadowBox will create a mesh where every there is a mask. If more then one plane is masked then ShadowBox will create a mesh where the masking intersects. The Resolution of the ShadowBox is controlled by the Resolution next to the Remesh All button. The Resolution must be set before clicking on the ShadowBox button. Remember the higher the resolution the more dense level one of the output mesh will be. By turning on Transparency with Ghost, features such as Radial Symmetry or creating holes in the mesh will be possible. For the ZRemesher section see here. The Close Holes button will close all open holes of a mesh. It is recommend to run the Remesh All followed by a Project All to capture all detail. Close Holes can only be run on a mesh with no subdivision levels. Partially hidden meshes: the Close Holes function will close holes in partially hidden models, after which the entire model will be made visible. The surfaces created to fill the holes will have a different Poly­Group.An example of this capability is that you can easily hide a portion of a model, close the resulting opening and then close holes again with the fully visible model to cre­ate an internal wall. The Optimize Points Order button will optimize the points order of the mesh. When the Merge Tris button is pressed all triangles will be converted into quads wherever possible. When the Weld Points button is pressed all unmerged points of the selected SubTool will be merged. The Unweld Group Border function, located in the Tool >> Geometry >> Modify To­pology sub-palette will unweld all the vertices where two or more PolyGroups intersect, creating independent surfaces out of the currently selected Tool/SubTool. At this point you can assign a new PolyGroup to two or more of these individual pieces. Clicking Unweld Groups Border again will weld those parts back together. On the left, the original Mesh with two different PolyGroups generated using the Group Front func­tion. 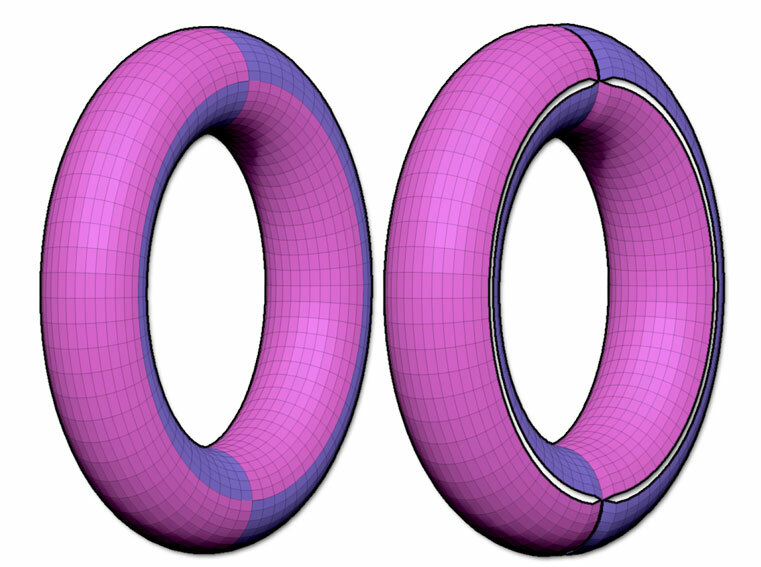 On the right, Unweld Group Border was then applied and the torus deformed using the Inflate Balloon deformation. Notice that each PolyGroup is now split from the others. When the Mesh From Brush button is pressed the selected InsertMesh will be converted into a SubTool. If a SubTool is currently selected the InsertMesh will replace this SubTool. It is recommended to append the PolyMesh3D Star and have that selected when implementing this feature. When the Delete By Symmetry button is pressed all geometry on the oposite side of the selected axis will be deleted. The Equalize Surface Area button will evaluate the surface and add geometry to surface that has been stretched and is light on geometry. The Tool must be on the lowest SubDiv level in order to activate. Equalize Surface Area can be applied more then once, however triangles will be created at intersecting points. 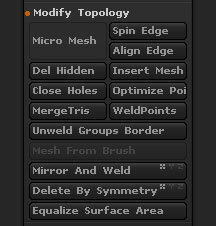 The Check Mesh Integrity will check the integrity of the mesh for use in ZBrush. This is ideal to track any issues that may have encountered with the mesh, such as non-manifold edges. The Fix Mesh utility is able to repair topology errors such as non-manifold edges in your mesh. It can be useful to run this utility if you find that your model produces topology errors in other 3D packages.